Weekend Cooking, hosted by Beth Fish Reads is a semi-regular post at Book’d Out. 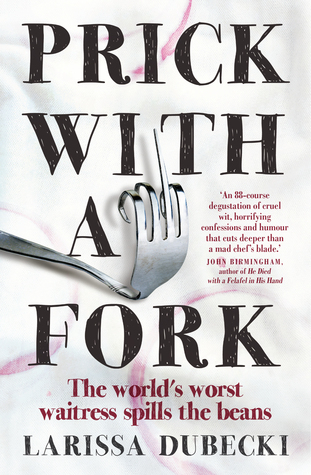 Prick With a Fork is a funny, lighthearted expose of the food industry from the point of view of a disenchanted waitress turned restaurant critic. From almost killing a stripper with a wayward steak knife to staging go slow’s to frustrate obnoxious customers, Larissa Dubecki claims she was the world’s worst waitress, unashamedly sullen, insolent, disinterested, and often hungover, yet she spent over a decade waitering in everything from cyber cafe’s to gastro pubs throughout Melbourne. In Prick with a Fork, Dubecki details working with psychopathic chefs, hostile customers, drug addled colleagues and bartenders on the take and reveals insider secrets about illicit trysts in coolrooms, cash hidden under registers, and unpleasant uses for carrots. Her anecdotes are hilarious, though often slightly nauseating, you may never be able look your waiter in the eye again. 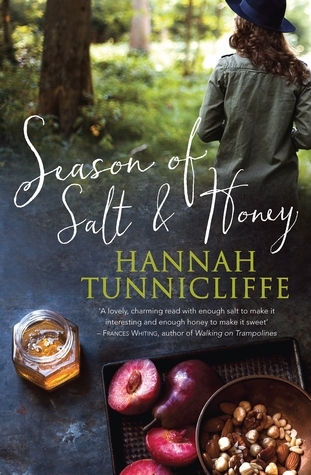 Salted with confessions and peppered with pathos, Prick with a Fork is a light and entertaining read. The Messy Baker is cookbook for the enthusiastic home baker with a mix of over 75 sweet and savoury recipes. 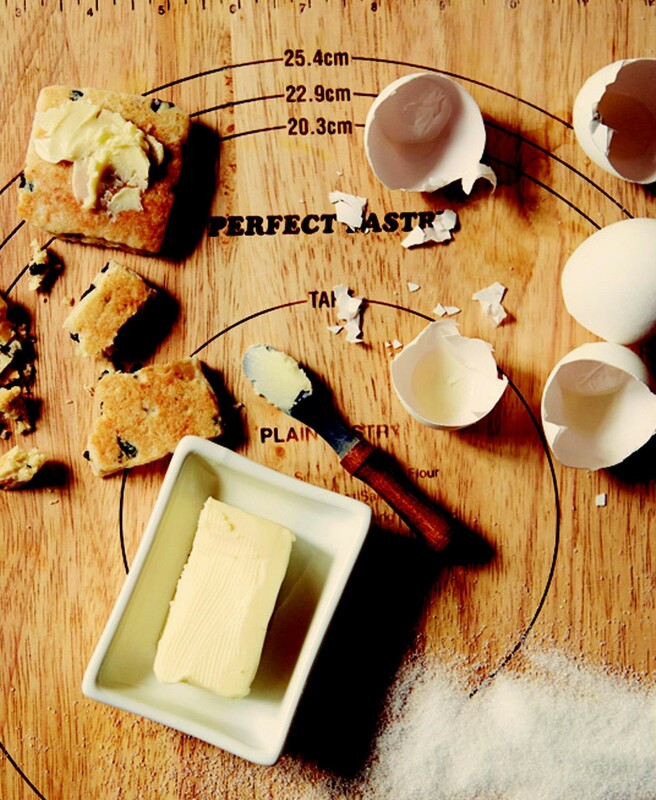 Full page photograph’s complement the appealing design, though not every recipe is featured. The first chapter, ‘Basics’, suggests ‘Can’t-do-without items’, Nice-to-have items, and ‘I’m-a-baker-and-I’ve-earned-it items’, before listing Essential ingredients that every baker should have on hand, their uses, tips for prep where applicable, and proper storage of said ingredients. And if you are still feeling a little lost, the Appendix includes a glossary, a measurement conversion chart, and a list of emergency ingredient substitutions. Christie then begins with recipes for puff, shortcrust, and Pate Sucree pastry, as well as tips for working with phyllo pasty. The recipes are sorted into seven chapters categorised by texture. Flaky recipes include Morrocan Lamb Parcels, Chocolate Dipped Vanilla Scented Palmiers and Cherry and Lemon Macaroon Meringues. Crumbly treats include Stuffed Tomato, Arugula, and Cilantro Focaccia, Savoury Pecan and Cheddar Bites and Deep, Dark Cherry and Chipotle Brownies. The Dippable recipes are for dunking in coffee, tea, milk, soups, or sauces and include Rosemary and Black Olive Grissini, and Espresso and Hazelnut Biscotti. If you prefer foods that drip or ooze their filling then the Smoky Mushroom Crepes or Boozy Chocolate Torte (shown on the book’s cover), found under Sloppy, might appeal. The Peppery Pear and Smoked Gouda Dutch Baby and Burnt Caramel and Sea Salt Sticky Buns are two recipes found under Smudgy. Gritty sweet and savoury recipes include Many-Seed Lavash Bread and Citrus-topped Poppy Seed Bars. Drippy recipes include temptations such as Lime-Cilantro Dipping Sauce, Boozy Brown Sugar Whipped Cream and Chocolate Anything Sauce. 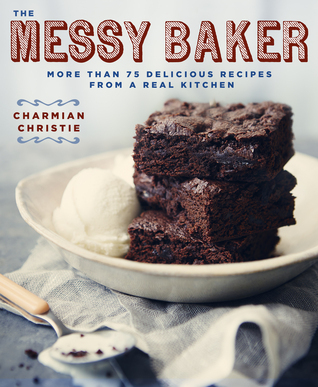 I liked the tone of this cookbook, Christie’s notes are encouraging, her tips are useful and of course there is no expectation of perfection, though there is an art to pulling off the ‘messy’ look. What it does lack is an index, and Christie’s timing ‘Commitment’ approach is a little eccentric. The Best Homemade Snacks on the Planet contains more than 200 recipes designed to tempt toddlers, children and perhaps even teenagers to snack on wholesome homemade treats. My copy of The Best Homemade Snacks on the Planet is a large format softcover. The recipes are generally presented two to a page. Though there are full page colour photographs every few pages, not all recipe results are pictured. Both metric and imperial measurements are provided, as are yield amounts. In the first chapter you will find time-saving tips, storage solutions, information about allergies, ingredient substitutions, and Laura Fuentes ‘Snacking Rules’. The Recipes are sorted into seven chapters titled Fruit and Veggie Snacks, No-Bake Bites and Dips, Baked Bites, Reimagined Classics, Mini Meals, Super Smoothies and Drinks and lastly, Frozen Delights and Special Treats. Simple to prepare and serve, using largely fresh and easy to source ingredients, recipes include Crunchy Berry Salad; Chocolate Avocado Pudding; Oatmeal Raisin Cookie Dough Bites; Cheese Crackers; Ninja Turtle Nuggets and Elvis Shakes. The final pages of the cookbook includes a Feedback Chart, allowing you or your child/ren to rate and make notes for each recipe. 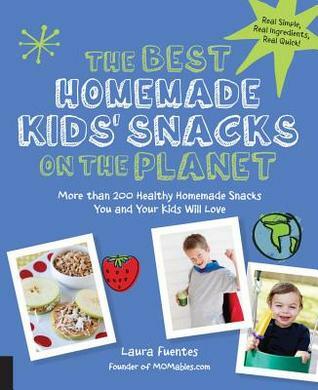 The Best Homemade Snacks on the Planet offers a practical collection of snack recipes with plenty of appeal for a child’s fussy palette. While this would be the perfect gift for any busy mother, the recipes could also appeal to adults who enjoy healthy snacks and treats. 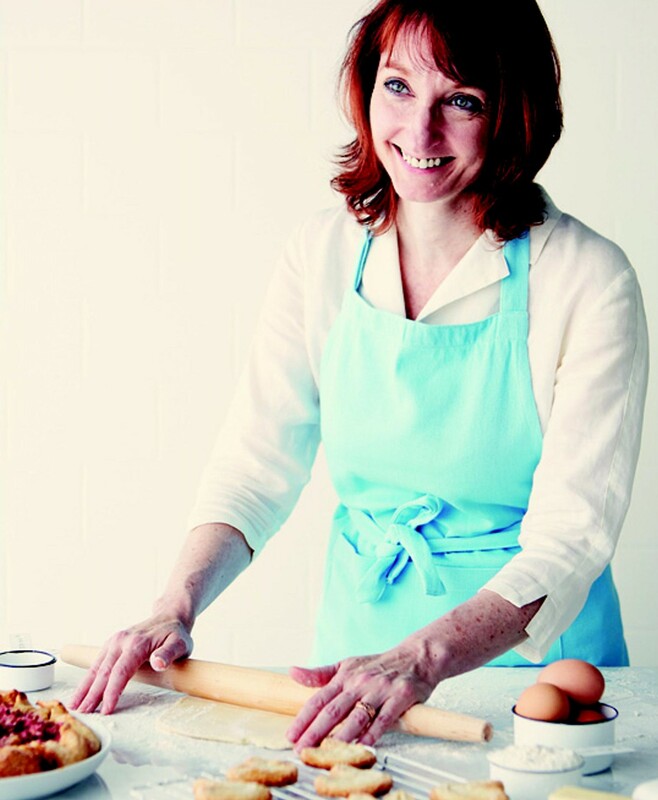 Visit the author’s website for additional recipes, instructional videos and more. Offering a good mix of dishes suitable for singles, couples and families with a liking for fresh, (and mostly) healthy ingredients, Eat the Week is a good resource for a home cook looking for a simple way to add a gourmet touch to everyday meals. The large hardcover cookbook is illustrated both with full page photographs of the dishes as well as some ‘lifestyle’ shots of the author. Neatly formatted, with a sentence or two of introduction, the recipes include both metric and imperial measurements, as well as a guide to prep and cooking time as well as serving size. 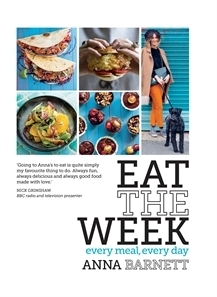 What I really like about Eat the Week is the way in which it is organised. For each day of the week, ‘Budget Mondays’, ‘Lazy Tuesdays’, ‘Make it Fancy Wednesdays’, ‘Cooking for Company Thursdays’, Barely in the Kitchen Fridays’, ;Something Special Saturdays’ and ‘Slow Sundays’, Barnett offers two menus which both include a Breakfast, Lunch, Snack, Dinner, Dessert and Leftovers. A mixed sampling of the dishes includes Muffin Tinned Huevos Rancheros; Beet and Blueberry Smoothie; Asparagus, Parmesan & Pesto Crostini; Chilli Kale Chips; Pub Peanut Noodle Salad; Haloumi & Chorizo Salad Wrap; Fishcakes with Spicy Roasted Tomato Salsa; Cheat’s Aubergine Parmigiana; Peanut Butter & Cherry Chocolate Cups; and Pineapple & Gooey Coconut Macaroon Stack. There are around 100 individual recipes, many of which are suitable for vegetarians. Few are labour intensive, most requiring a minimal amount of prep or cooking time, and appeal to varied grocery budgets. If you’re curious, sample pages, including recipes can be viewed via Amazon’s Look Inside feature. Founded in March 2013, My Food Bag is a service that aims to provide simple and healthy recipes, along with the all of the ingredients to create them, to families in New Zealand and Australia. Firm believers in the real (or whole) food philosophy, My Food Bag recipes rely on ‘farm-gate to plate’ ingredients which are ethically sourced and delivered fresh to subscriber’s doorsteps. Easy Weeknight Meals is the company’s first cookbook. 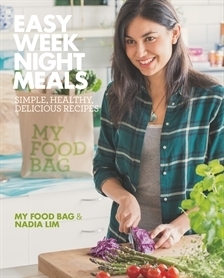 While all of the recipes have been developed by professional chef’s, a team led by Nadia Lim, My Food Bag claims all of the recipes have been tried and tested by home cooks. 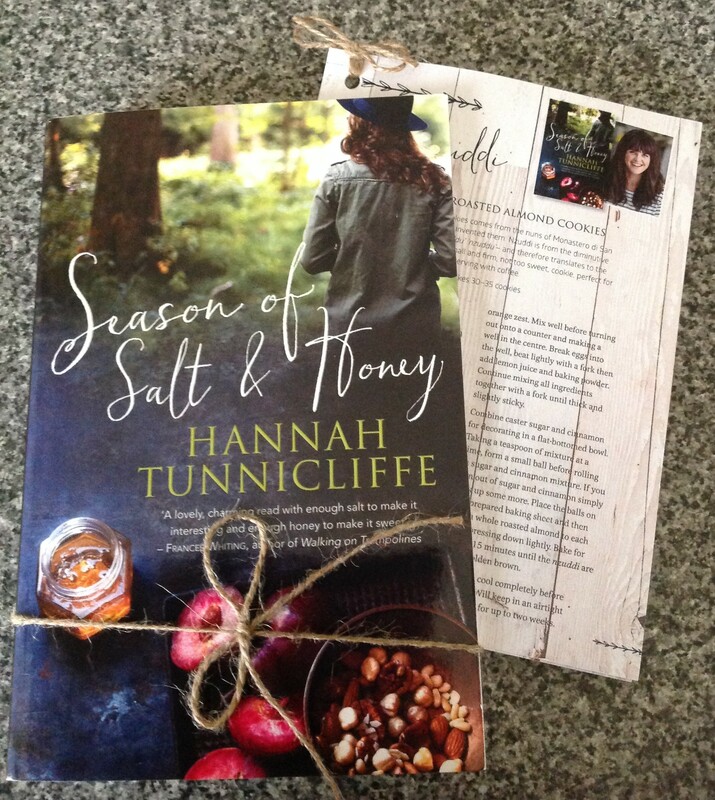 The cookbook is organised seasonally, taking advantage of in-season produce in line with the company’s whole food policy. The recipes are well set out with a bolded list of ingredients (metric measurements), and have clear instructions for prepping, cooking, and serving the dish. Prep and cook times are included as well as the nutritional information for each recipe. Each recipe is a complete main meal often including vegetable or salad sides, as well as sauces. Almost all claim a serving size of 4-5 persons (2 adults and three young children or 2 adults and two teenagers). All of the meals can be prepared and served within an hour, most within 30 minutes. There is a strong Asian influence amongst the recipes in the cookbook with dishes like Asian Pesto Fish with Sesame Spring Toss and Coconut Rice, Korean Beef and Shitake Mushroom Bibimbap, Sticky Hoisin and Ginger Pork with Rice and Bok Choy and Chicken Katsu Skewers with Cabbage and Sugar Snap Soba Noodles. Middle Eastern inspired dishes are also popular including recipes such as Baked Lamb Kofta with Tomato Pilaf and Yoghurt Dressing, Harissa Chicken with Fennel, Orange, Baby Beet and Feta Tabouleh, and Hummus, Grilled Haloumi with Israeli Couscous, Yams and Herb Vinaigrette. Traditional recipes are ‘upgraded’ with meals like Fish and Crispy Potatoes with Apple and Rocket Salad and Lemon Caper Aioli, Giant Pork, Pumpkin and Sage Sausage Rolls with Coleslaw, Venison Burgers with Roast Pepper and Blue Cheese, and Pizzettes with Olives, Feta, Oregano Oil and Greek Salad. 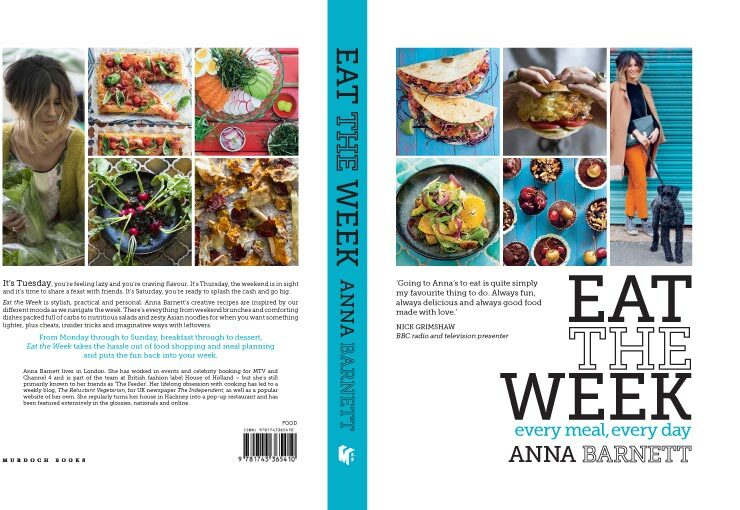 If I’m honest most of the recipes in Easy Weeknight Meals are too ‘gourmet’ for my family’s taste, but for parents whose children are adventurous eaters, this cookbook could be a great resource for weekly meals. I also think Easy Weeknight Meals would be a useful reference for busy professional couples. Food52 Genius Recipes: 100 Recipes That Will Change the Way You Cook is written by Food52.com’s executive editor Kristen Miglore. Each of the featured recipes is of “Genius” stature, meaning they are first created by professional cooks and bakers, then submitted to Food52.com, a popular website which launched in 2009, by community members with their recommendation. I was curious about the recipes included in this cookbook, and their claims of genius. I enjoy cooking but I’m all about keeping it simple – in both method and taste. 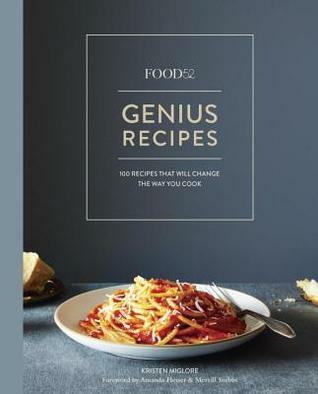 Honestly, the only recipes I will likely try from this collection are Gabrielle Hamilton’s Grilled Cheese Sandwiches, which recommends slathering the outside of the bread in mayonnaise, instead of butter, before grilling them in a non stick frying pan; the Tomato Sauce with butter and onion which makes a simple but tasty sounding pasta sauce; and Cheater Soft Serve Ice-cream. However, more adventurous foodies should enjoy the range of recipes, many which are suitable for vegetarians, and should appeal to both enthusiastic beginner and intermediate home cooks. Breakfasts like Poached Scrambled Eggs and Chocolate Muscovado Banana Cake sound good. Mains range from Shrimp Grits to Sticky Balsamic Ribs, Cauliflower Steaks to Kale Panini, plus there are recipes for salads, soups and sides. Desserts include Nigella Lawson’s Dense Chocolate Loaf Cake and an interesting technique to create Caramelized White Chocolate. While Food52.com has a regular ‘Genius’ column, it’s important to note that the author claims more than half of the recipes in this cookbook have never been published in the column before, so fans should still find something new to interest them. The publisher’s book page shares a recipe for Chocolate Mousse from Herve This plus a ‘Look Inside’ feature. I’ve decided to make the Weekend Cooking meme, hosted by Beth Fish Reads a regular monthly post at Book’d Out. Cooking is something I enjoy and I have been making more of an effort again lately, so I am looking forward to participating. Every Thursday night for decades a small group of Umbrian women, occasionally accompanied by the their husbands or lovers, have met in an old stone house belonging to Miranda to share their supper. Under sheaves of dried olive branches, seated on plank benches, they have laughed, cried, cooked and eaten together. Befriended by Miranda, Marlena De Blasi, an American chef, journalist and food critic who has made her home in rural Orvieto, was invited to join the women, taking a place at the table every Thursday, delighting in both the food, and the stories each woman has to tell. In The Umbrian Supper Club, Marlena shares what she learned of the lives of the four women members – Miranda, Ninuccia, Paolina and Gilda, as she joined with each in preparing Thursday night suppers over a period of four years. The women’s stories are moving and fascinating, aged between 52 and 80 something, they have lived full lives. They have variously been wives, mothers, daughters, sisters and lovers, they have endured heartache, loss, poverty and celebrated love, friends, and food. They speak, as the gather, prepare and cook their supper of childhood, family, aging, sexuality, of the evil eye, the Mafia, religion, of life and death. Full of mouthwatering descriptions of food preparation and feasting, The Umbrian Supper Club will delight any foodie. Crusty bread freshly baked in a woodfire oven is dipped in oil pressed by a donkey driven mill, pasta is simmered in litres of local red wine, thyme leaves are stripped from their branches to flavour scored duck breasts. Several full recipes of traditional Umbrian dishes, such as Zucca Arrostita and La Crostata di Pere e Pecorino adapted for the modern cook, are included, but plenty of cooking advice is informally dispensed through the pages. 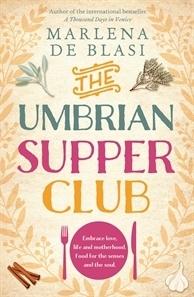 The Umbrian Supper Club is a delightful true story of family, friendship and food. I’ve decided to make the Weekend Cooking meme, hosted by Beth Fish Reads a regular monthly post at Book’d Out. Cooking is something I enjoy and I have been making more of an effort again lately, so I am looking forward to sharing some of my culinary adventures. The basic principle behind Once A Month Cooking is that you cook all your main dishes for a month in one day, freeze them, and then have an assortment of home made meals ready when you need them. The benefits of the plan outweigh the initial work involved in that it not only do you have more precious time during the busy week previously taken up by shopping for, preparing and cooking meals daily, but you can also save money when you purchase and cook in bulk. Allen begins by offering advice on planning, shopping, cooking and freezing for Once a Month Cooking. Planning is an important step in the process and one that can involve the family in choosing what meals will be served during the month and take into account their schedules for the weeks ahead. Plan for a variety of meals but not so many that you end up cooking 30 different dishes, batch up favourite recipes that the family would be happy to eat once a week. Keep in mind what utensils and cookware you will need for the dishes you choose, and make sure you have plenty of storage items such as good quality ziplock bags in a variety of sizes, baking paper, plastic wrap, foil and foil/plastic containers plus a permanent or freezer marker. Make a comprehensive shopping list, be specific about amounts of food needed, and watch the budget. Source local when you can and look for bulk deals on ingredients. For the day of cooking, Allen suggests choosing a time when you won’t be distracted by young children or other commitments. Have your recipes accessible and start with prep eg dice onions, brown meat, blanch vegetables, boil eggs etc in amounts that work for all your recipes not just one. Assemble recipes that use a similar cooking method so you can have, for example, 3 different casseroles in the oven at once or so you can easily monitor foods cooking on the stove top. Clean as you go so you don’t run out of dishes and utensils. Allow foods to cool before placing in the freezer, ensure the meal is labelled with a name, the date it was frozen, a use by date and the dish size. You can also add instructions for reheating. Don’t forget to make a master list of the meals you are adding to your freezer for easy reference. 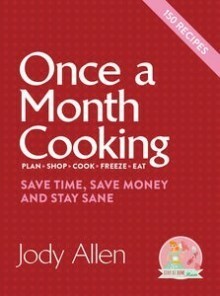 There are over 150 freezer friendly recipes in Once a Month Cooking, ideal for a busy family, and not just for dinner. Allen includes recipes for breakfast meals, like Banana Bread, Bran Muffins and Pancakes, soups such as Bacon and Potato Soup and Thai Pumpkin Soup, snacks like Pizza Scrolls, and Frozen Banana Pops, and deserts, cakes, slices and biscuits like After-dinner Mint Ice-cream Slice, Teacup Baked Cheesecakes, Lemon Lunchbox Squares and Sticky Date Caramel Slab. 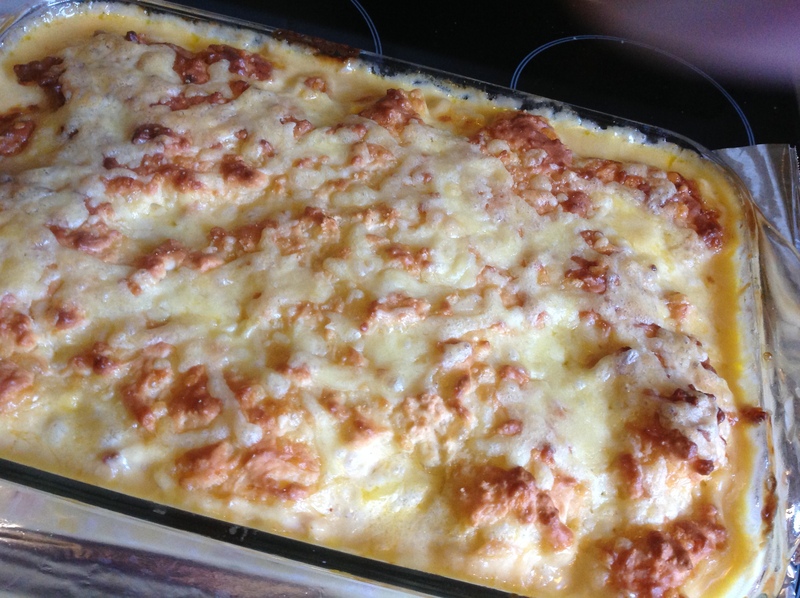 There are also recipes suitable for vegetarians and those with food intolerances or allergies, like Lentil and Pumpkin Lasagne and Gluten-free White Chocolate Cake. The recipes for the main meals use a variety of meats and include recipes for Coconut Curry Sausage Casserole, Beef Chow Mein and Chicken Filo Parcels. The recipes are largely unfussy, using common ingredients simply prepared, but could easily be tweaked to suit individual tastes. Though many are familiar to me, I found the details about freezing and thawing the meals very useful. The presentation of the cookbook is a little disappointing, while the spiral bind is useful, the cardboard cover is fairly flimsy and I would have preferred a sturdier cover. There are no images accompanying the recipes, though a few pages of photo’s are included in the opening chapter. The recipes are well set out with a list of ingredients (metric measurements), and have clear instructions for prepping, cooking, freezing and thawing each meal, but they lack serving size suggestions, or advice for doubling up or ‘batching’ the recipes, and and an overall indicator of prep/cooking time. I’ve been pre-planning weekly meals for a few years now, our busy family of six is on a tight budget and I really have to carefully manage both our time and expenditure. I’d love to be able to shop, prepare and plan a month ahead but unfortunately it’s not possible financially, and I don’t have a freezer big enough, however the same principles of Once a Month Cooking can be applied to a weekly or fortnightly (bi-weekly) schedule. Last weekend I cooked up a double batch of the Chicken Casserole with Cheesy Damper Top (I doubled the recipe so we ate one that night and I froze the other) plus a double batch of Bolognese Sauce (with my own tweaks) , and garlic bread. This weekend has been very busy so I’m making a double batch of Mexican Minced (ground) Beef (for Nachos and Burritos) and Honey Chicken Stir Fry tomorrow. I’m also planning on making some of the snack and slice recipes such as the Clinker Slice, Milo Balls and Fruit Salad Cake through the week to freeze in advance of my son’s birthday party in two weeks time – I never would have thought of it previously. Once A Month Cooking is a good resource not only for someone interested in adopting the practice, but also for busy and budget conscious families who are simply looking for easy and tasty recipes that can be prepped ahead. I know I will be using it a lot!